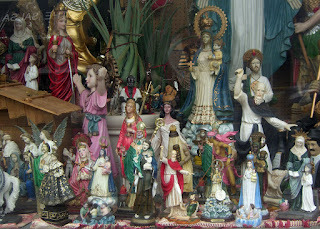 Our local botanica is a neighborhood fixture.The front window is an ecumenical tableau of nativity scenes, Buddhas, the Virgin of Guadeloupe, Jesus as a child, Saint Michael, Saint Francis and more. The shop's shelves are crowded with terra cotta pots, herbs, rosaries, candles and special oils. There are candles in glass cylinders devoted to every saint you may or may not know. Lately there has been an increase in the sales of those candles, as people look for a way to take some small action that will give them some hope or keep them and their loved ones safe. When you are feeling alone or helpless, you can at least light a candle and offer up a prayer of hope.